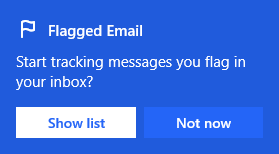 To manage your flagged email directly in Microsoft To-Do, just sign in to the web or Windows app using the same work or school account that you use with Office 365. To enable the Flagged Email list select the option to Show List. Alternatively, you can also turn the list on in Settings. After the Flagged Email list has been enabled, it will be populated with up to 10 flagged emails from the last 2 weeks. 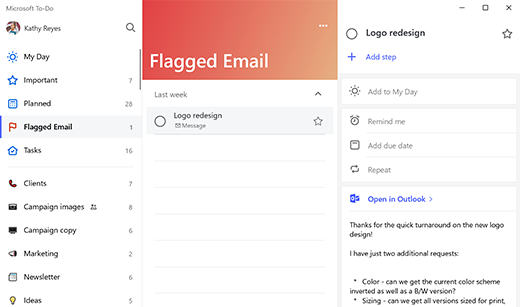 All emails flagged from that point forward will also be converted into fully editable tasks in To-Do, which can be renamed, assigned due dates and reminders, added to My Day and marked as Important. Once enabled, the Flagged Email list will also be accessible in To-Do on iOS and Android. The task will also include a preview of the email's text. To open the original email select the option to Open in Outlook from the detail view. Please know that the Flagged Email list is currently only available for work or school accounts. At the moment, personal Microsoft accounts are not supported, though we will support more account types in the future.